Unlike the Xbox One, which locks the console’s Game DVR features behind a Xbox Live Gold subscription, the PS4 won’t require users to have a PlayStation Plus subscription to use the console’s DVR features. 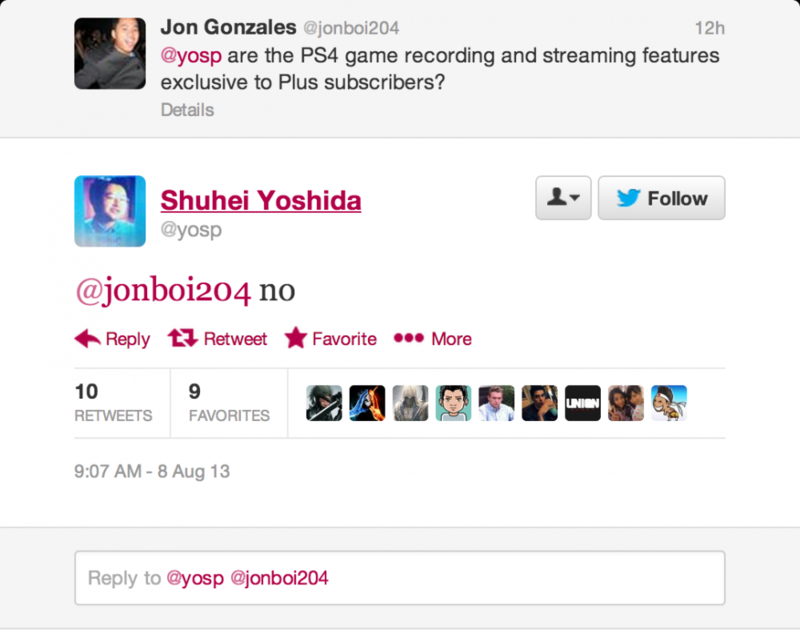 The news was confirmed by a tweet from Sony’s Shuhei Yoshida in response to a question from @jonboi204. The PS4’s DVR stores the last fifteen minutes of gameplay on the hard disk, ready for you to edit and upload at the press of a button. The Xbox One was confirmed to record footage in 720p at 30fps, but the quality of PS4 videos are still unknown. Hopefully, the answer to this and other questions will be revealed at Gamescom later this month.